and soap or ash reduces the spread of disease. Nafisatu Yunusa is excited about change. The 23 year-old mother of three lives in Marafa, a village of just over 600 people in Bauchi State, northern Nigeria, where the dry winter season can be hard. Red dust clouds the sky, vegetation turns brown, and there's no rain for months. Like other rural communities in the region, for a long time, many people in the village of Marafa did not have access to running water or toilets. Without them, open defecation was the norm. Most households had lost at least one family member to preventable diseases such as cholera and typhoid. Fields and villages were contaminated with feces, which was not only unsightly and malodorous, but was also extremely unsanitary. “Back then, our children were always suffering from diarrhea, typhoid fever, cholera," Nafisatu explains. "It was the biggest challenge we had, it was everywhere." Information about stopping open defecation has helped to make the village a more attractive – and healthier place to live. But the establishment of a Water, Sanitation and Hygiene Committee, or WASHCOM, in her village, has transformed Nafisatu's life. The WASHCOMS have been set up in communities in the area under UNICEF’s SHAWN (Sanitation Hygiene and Water in Nigeria) programme, which is funded by the United Kingdom’s Department for International Development (DFID). Nafisatu works as a treasurer for the WASHCOM and is one of the nine Mafara WASHCOM members who have been trained to teach healthy sanitation practices to others in the community. “Now when a child goes to use the toilet he or she comes and washes hands – with soap, if it is available, or ash,” she says, “and that has contributed a lot to stopping the spread of diseases." As a result, Marafa has become one of 351 communities that are now certified as “open defecation free” in the Local Government Area of Dass, in Bauchi state. Every household in the community has a latrine and nearby hand washing facilities. And the SHAWN programme has rewarded the community with a borehole and hand pump, so that water is now easier to access, even in the dry season. The United Kingdom’s DFID supported this UNICEF project. 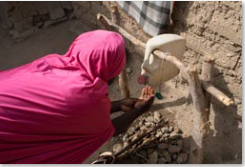 The improved sanitation and easy access to water, says Nafisatu, has not only saved lives, but it also helped ease a common strain on marriages in Marafa. Among the good hygiene practices they have been trained to teach, WASHCOM hygiene promotion team members have shared their knowledge with women community members about menstrual hygiene management. When water is easily available, good hygiene practices are also easier to implement. Nafisatu recalls that women in the village used to stuff dirty menstrual padding under their beds, which often made the bedrooms smell unpleasant. Their husbands, recounts Nafisatu, would burn spirals of mosquito coils, hoping the acrid smoke would cover the smell. But sometimes, even that wasn’t enough, and Nafisatu said that several husbands even refused to sleep with their wives. on good hygiene and sanitation practices.